Too much sitting at work has been implicated as the cause of several health issues. Patrick Roth, I am a neurosurgeon interested in patient-centric care and transparency. I am the author of The End of Back Pain. Too much sitting at work has been implicated as the cause of several health issues that include premature mortality, impaired metabolism of glucose and metabolic syndrome (increased blood pressure, cholesterol levels, and excess body fat around the waist). Sitting has also been charged with a causative role in back pain. The prevalence of back pain is staggering. At any given time, 20% of us will be experiencing back pain. Over the past year, the prevalence rises to 40%. In a lifetime, that number approaches 80%! Czech neurologist Vladimir Janda described a “lower cross syndrome” that is also the result of too much sitting and marked by weak gluteal muscles and tight iliopsoas muscles. In this condition, too much sitting stretches and thus weakens the gluteal muscles that are located posteriorly and shortens and stiffens the psoas muscles that are located anteriorly. This imbalance can be a source of back pain. As a result of the apparent correlation between sitting and back pain, there has been considerable attention focused on the design of our workplace to diminish the ubiquitous complaint of back pain. This includes an assortment of ergonomic interventions that include trying to reduce the amount of time sitting, changing the position of our computer screens, changing the design of our chairs, etc. Unfortunately, scrutiny of these ergonomic interventions has found them to be largely ineffective in preventing back pain. What if there was an exercise that could be done in the confines of a typical office environment that would theoretically counter the deleterious effects of too much sitting? What if that exercise also required not only minimal space and time, but a single piece of equipment that could be stored under the desk? The kettlebell is the ideal antidote to excessive sitting in the office. Instead of simply getting up hourly for a stretch and a brief walk, how about doing one minute of kettlebell swings in addition? We are advised to get up, stretch, and walk around to counter the excess sitting while at work. While this is sound advice, I think that swinging a kettlebell is a better alternative. The swing is an ideal exercise to counter the back dysfunction attributed to excessive sitting. The swing simultaneously strengthens the gluteal muscles and the abdominal muscles while stretching the tightened iliopsoas and other hip-flexor muscles. It is the antidote to sitting. At the same time, one minute of swings will burn 20 calories, and if done each hour, will burn the equivalent daily calories of a non-sedentary job. Perhaps the most important benefit of kettlebells in the workplace would be their potential for mood elevation. Interestingly, the most effective “ergonomic” intervention for back pain turns out to be improved job satisfaction. If you want your back to hurt less, find a way to enjoy your job more — it is more effective than finding the ideal chair. 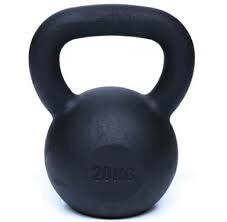 I am convinced that a culture of intense, intermittent bouts of kettlebell swings at the workplace would increase productivity, mood, and job satisfaction. That may turn out to be the ultimate ergonomic intervention. One small kettlebell in the office, hidden under one desk, shared by all those that sit, can provide a shared, time-effective source of back strengthening, hamstring and hip-flexor stretching, cardiovascular stimulating, calorie-burning, and mood elevating opportunity.